The construction of ALMA began in 2003 and should be finished in 2013. Although the array is still under construction, ALMA is currently accepting proposals for Fall 2011 using 16 antennas and four of the ten receiver bands. More information on the Early Science Cycle 0 Call for Proposals is available on the ALMA website. The deadline for submission of Notices of Intent is April 29, so get writing! When completed, ALMA will consist of 50 12-m antennas. Like the antennas in the Very Large Array and the Submillimeter Array, the ALMA antennas will be mobile to allow for different observing configurations and consequently different spatial resolutions. In addition to the 50 12-m antennas, ALMA will also consist of 12 7-m antennas. Those 7-m antennas and four of the 12-m antennas will make up the Atacama Compact Array (ACA) and will remain in roughly the same position for all observations to increase ALMA’s ability to map large scale structures. The Atacama Large Millimeter Array is currently under construction on the Chajnantor plain in the Atacama desert in Chile. Since the site is at an altitude of 5000 meters and quite dry (precipitable water vapor ~ 1 mm), the atmospheric transparency should be excellent for submillimeter observations. 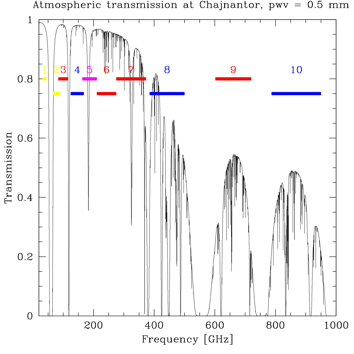 The figure below displays a plot of the atmospheric transmission at Chajnantor and the ALMA Observation Bands. Logically, the ALMA Observation Bands were chosen to fit between the major absorption features of water and oxygen. Detect line emission from CO or CII in under 24 hours from galaxies at a redshift of z=3. Observe gas kinematics in protostars and protoplanetary disks within 150 pc. Acquire high dynamic range images at high angular resolution (0.1″). ALMA will be particularly useful for detecting extrasolar planets and stars during the early stages of formation. 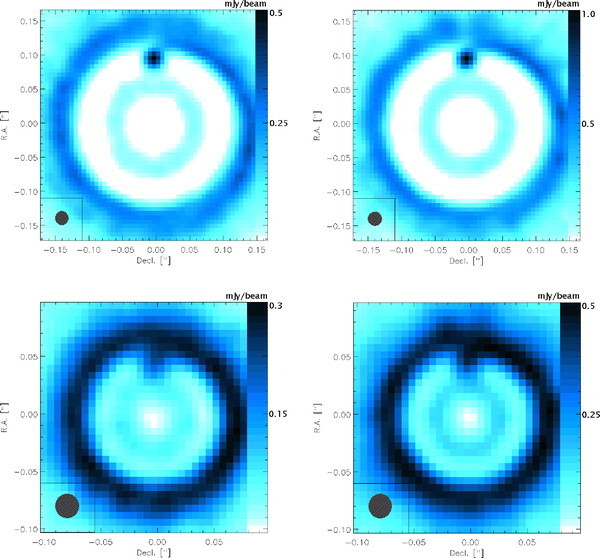 The figure below shows a simulation by Wolf & D’Angelo 2005 of possible ALMA observations of embedded Jovian planets. The 1 Jupiter mass and 5 Jupiter mass planets are clearly visible at both 50 pc and 100 pc! Simulation of ALMA observations of an embedded planet. The dot in the lower left represents the combined beam size. Left: 1 Jupiter mass planet around a 0.5 Solar mass star in a 0.01 Solar mass disk. Right: 5 Jupiter mass planet around a 2.5 Solar mass star, Top: Distance of 50 pc, Bottom: Distance of 100 pc. Figure 2 from Wolf & D'Angelo 2005. ALMA will also advance studies of interstellar dust grains by allowing scientists to create high resolution (<0.1") images of the dust condensation zones around AGB stars at distances of a few hundred parsecs. By comparing the angular sizes of CO envelopes around evolved stars to the known distances of those stars, astronomers will be able to determine the physical size of CO emitting regions. The distances to other evolved stars could then be estimated by comparing the observed angular size of the CO emitting regions around stars of unknown distances to the newly discovered characteristic physical size of CO emitting regions. Once the distances to a large number of evolved stars have been determined, astronomers could then map out the distribution of AGBs. Since many molecular transitions occur at submm wavelengths, ALMA will be sensitive to the presence of a wide range of molecules. Additionally, ALMA will be able to measure the radii and rotation rates of stars and monitor the activity of the Sun. ALMA will conduct observations in ten different bands from 84 GHz to 720 GHz at resolutions between 6 mas and 0.7″. The resolution is frequency- and baseline-dependent; the resolution decreases with decreasing baselines and lower frequencies. Within a given band, ALMA will produce a data cube containing up to 8192 frequency channels with widths between 3.8 kHz and 2 GHz. In the most compact configuration, ALMA will have baselines between ~18m and ~125m. In the extended configuration, the baselines will be between ~36m and ~400m. See the ALMA Capabilities page for more detailed observation about planning observations with ALMA.